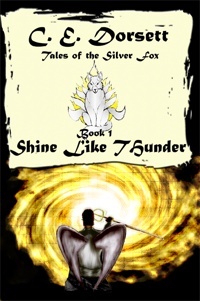 Shine Like Thunder is Out! As we were leaving to go into town today, the mail lady pulled up and dropped off a package. I tore it open and began to beam with excitement at the sight of a brand new copy of Shine Like Thunder! The cover looked better than I could have imagined! I couldn't help but giggle for hours afterwards. There is something very special about seeing a story you poured your heart and soul into in print. I have approved the galley, and the book will show up in book store catalogues over the next 6 weeks, but if you want a copy, you can buy it now [here]. It is available as a digital download and as a printed paperback. I cannot wait to hear what you all think of the new book. I feel that I should warn you though. This book is the darkest story I have written in years. It rides a fine line between planetary romance and dark fantasy. It takes place shortly after the events in Liquid Sky. Alone in a remote garrison of his father's empire, Saahdia Ghassan sits alone in his sanctum, watching as the darkness draws nearer. Suddenly, the ground shakes. Invaders fill the sky. Ordered to find help they flee only to be struck down on a remote and desolate world. Now the ship is lost and their attention turns to survival. With demons haunting the dark forest and their malevolent leader hungering only for power all the while a terrible thirst grows within Saahdia. Will he be able to discern who to trust before it is too late? Can they survive the struggle against the looming darkness? Join us as we delve into the murky underworld of Barrens End in the exciting first installment of The Tales of the Silver Fox.